On November 6th, the protections that keep me safe every single day in public spaces could disappear. We can’t let that happen to kids like me and so many others in Massachusetts. Transgender people in Massachusetts should have the same basic protections under the law as everyone else. 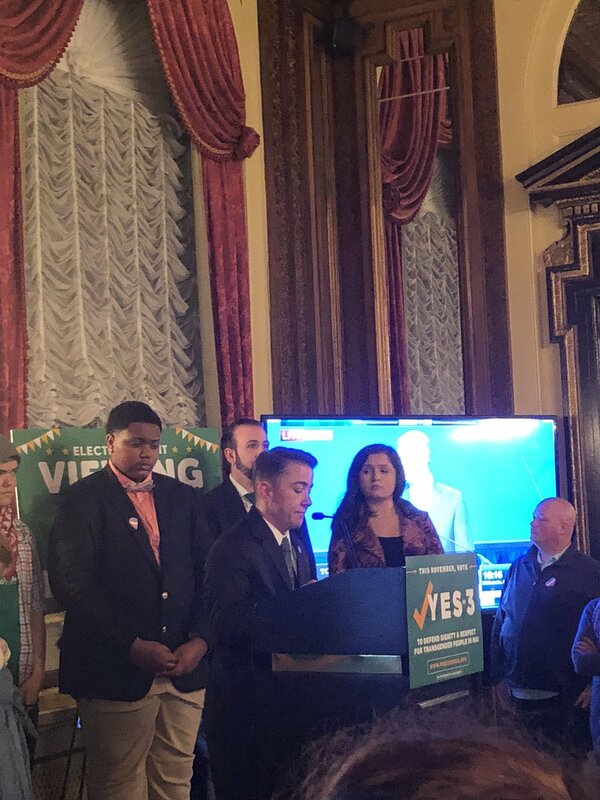 Vote Yes on 3! As parents, we want to protect our children above all else -- and that includes our transgender son. We want him to be treated with respect, to have fair access to everyday resources like restaurants, hospitals and public restrooms, and to be ensured the same legal protections that everyone else in our family has in the face of discrimination. Ensuring basic protections for transgender people—including youth—is the civil rights issue of our time. We're voting Yes on 3 this November because all children in Massachusetts should grow up knowing they are valued and protected under state law. Jane Doe Inc. fully supports the existing state’s transgender non-discrimination law because no one in our communities becomes less safe by laws protecting transgender people from discrimination. This law ensures we can all live our lives with privacy and dignity. Massachusetts, vote YES on 3! Debra Robbin • Executive Director, Jane Doe Inc.
Massachusetts parents are coming together to uphold transgender equality at the ballot this year. Not just to protect their transgender children from discrimination, but to say clearly that our Commonwealth will not tolerate discrimination in any shape or form. The Massachusetts Chiefs of Police Association and Massachusetts Major City Chiefs and 19 other local law enforcement officials support Massachusetts fair and equal treatment for transgender people. That’s why they’re standing with a broad coalition across the state in support of upholding Massachusetts’ non-discrimination law protecting our transgender neighbors, family and friends from discrimination in public spaces at the ballot this November. Leading sexual assault, domestic violence and women's organizations across Massachusetts have affirmed their support for our state's non-discrimination law ensuring explicit protections for transgender people in public places like restaurants, retail shops and doctors' offices—as well as gender-segregated facilities like bathrooms and locker rooms. These organizations want to make it clear: Ensuring these vital protections for transgender people does not diminish safety for sexual assault or domestic violence survivors. Discrimination isn’t just wrong—it’s bad for business too. That’s why nearly 200 businesses and industry organizations, led by Harvard Pilgrim, Google and Eastern Bank all strongly oppose the misguided effort to repeal Massachusetts’ non-discrimination laws protecting our transgender friends, family and neighbors from discrimination. Those businesses understand that when communities are welcoming places for everyone to live, work and raise families, businesses succeed as well. Faith leaders are speaking out in support of a YES vote at the ballot this November to uphold basic protections for our transgender neighbors, family and friends. These faith leaders believe that our Commonwealth’s laws should continue to reflect the Golden Rule: Treating others as you want to be treated. That is a core tenet of their faith, and it’s why they’re joining the Freedom for All Massachusetts coalition. Boston Mayor Martin J. Walsh, Salem Mayor Kim Driscoll and other municipal leaders strongly support fair and equal treatment under the law for transgender people in Massachusetts. That’s why they’re all speaking out in support of our Commonwealth’s non-discrimination laws protecting transgender people for discrimination in public spaces like restaurants, shops and hospitals. Under the banner Mayors for Freedom, these leaders agree that our cities are safer—and our state thrives—when transgender people are afforded explicit protections in public spaces. Elected officials from both sides of the aisle are standing together to say clearly: Discrimination has no place in Massachusetts. And they’re joined by our Commonwealth’s most iconic government entities—from libraries to city commissions—in committing to uphold our state’s non-discrimination laws protecting our transgender neighbors, family and friends at the ballot this November. See below for a snapshot of the growing coalition, and if you are an elected official or represent a government entity, sign up to join us today! These revered colleges and universities across Massachusetts are committed to providing the next generation of leaders with a robust education. And that means ensuring that all of their students are protected from discrimination. It’s why they are joining together to support our campaign to defend MA’s non-discrimination laws protecting transgender people from discrimination in public spaces like restaurants, shops and hospitals. Associations representing the state’s largest teachers unions, superintendents and school committees know the importance of treating everyone with respect. That’s why they all strongly support Massachusetts’ non-discrimination law ensuring fair and equal treatment for transgender people in public spaces like restaurants, shops and hospitals. Major labor unions and organizations across the state, including AFL-CIO, Massachusetts Teachers Association, and 1199SEIU, have officially announced their support for upholding MA’s non-discrimination laws protecting our transgender neighbors from discrimination in public spaces at the ballot this November. In total, the unions represent more than 65,000 families and workers across the state of Massachusetts. Every single championship New England sports team has joined our coalition supporting explicit protections for transgender people in public spaces like hospitals, restaurants and sports arenas. These teams know that our state is stronger when everyone is allowed to participate in public life—and know that they are protected under state law. 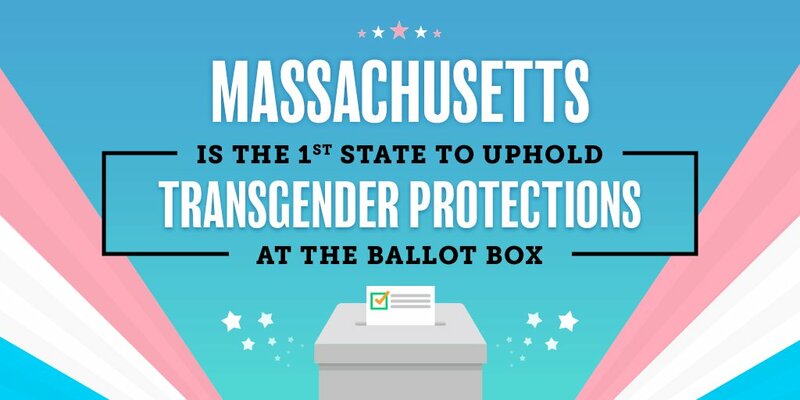 Organizations that work on the front-lines of making Massachusetts a better place to live and work are proud to join our campaign to defend basic protections for our transgender neighbors, family and friends at the ballot this November. 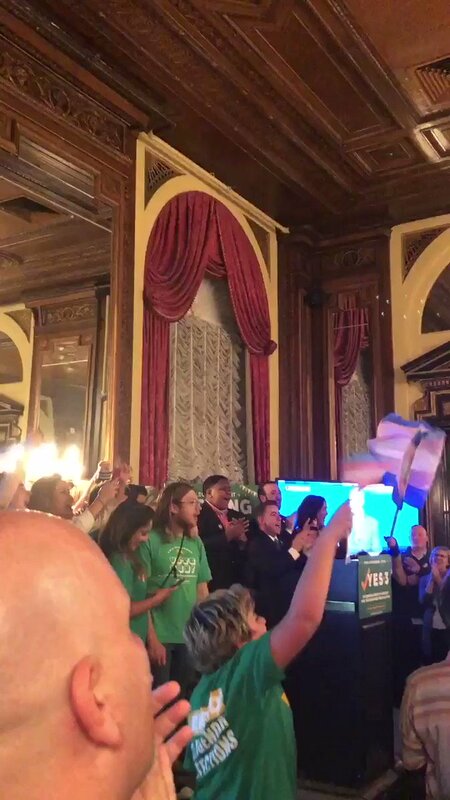 The Final Phase of This Campaign: Get Out The Vote! Discrimination is wrong—period. That’s why a growing chorus of Bay Staters are speaking out in support of protecting transgender people from discrimination in the places we all are when we’re not at home, work or school. Transgender people and their families are joining with Democrats, Republicans, leading businesses and faith leaders to make the case that discrimination has no place in Massachusetts. Read their stories below.